The eponymous extra-terrestrial from the Alien film franchise struck terror into our souls –razor sharp teeth, acid for blood, and an unusual capacity for memorising the layout of ventilation shafts. But it had another interesting trait – it had a parasitoid life cycle. A parasitoid is an organism that spends its juvenile life stage feeding on the body of a host. While a parasite allows its host to live, a parasitoid does not. It emerges from its dead host in a similar way to how the alien bursts out of the chest of a helpless crew member. But while the ‘xenomorph’ was a frightful fantasy dreamt up by Hollywood, parasitoid wasps are important creatures that live all around us, and we should try to understand them. Lemon tree borer parasite (Xanthocryptus novozealandicus), a native New Zealand parasitoid wasp. Image © by Pete McGregor. Image licensed under Creative Commons Attribution-NonCommercial 4.0. .
How many samples should you take? How many traps should you use? How long should you leave the traps out for? How much diversity can you expect to catch? How many traps are required to achieve the level of diversity you want? Netelia sp., a native New Zealand parasitoid wasp. Image © by Pete McGregor. Image licensed under Creative Commons Attribution-NonCommercial 4.0. .
By employing some of the concepts from optimal sampling theory, we can analyse the results from preliminary sampling and incorporate them into a new program that can tell us the answers to these questions. My master’s is tackling how this issue relates to New Zealand’s parasitoid wasps. I’ve collected my insect samples, and now I’m identifying the parasitoid wasps. Once that is complete, I’ll prepare some analyses which will help to build a foundation for the future study of these amazing insects. Me setting up a malaise trap at the Oratia field site. Once we know how to sample efficiently for parasitoid wasps, future work can look at some other interesting questions related to this group. For example, someone could look at how useful the NZ fauna would be as indicators of environmental quality, or surrogates for the diversity of other groups. This would help immensely in the selection of species and habitats to include in conservation planning. Who knows, you could be the one! Tom Saunders is a Master’s student at the Centre for Biodiversity and Biosecurity, within the School of Biological Sciences, at The University of Auckland. He is supervised by Dr Darren Ward (Landcare Research). You can find out more about Tom and his research at TomSaunders.co.nz. It seems ironic that dung beetles, a group of insects best known for their fondness of other animal’s excrement, can attribute their proliferation to the diversification of flowers. A recent study by Nicole Gunter and colleagues shows that the explosion of dung beetle diversity in the Cretaceous was due to a change in dinosaur diet to the newly evolved flowering plants. This low fibre, high nutrient dinosaur diet produced dung that dung beetles found more palatable and probably more appealing than bland, chewy conifer-containing crap. Burrowed deeply within this fascinating story are New Zealand’s 15 curious and enigmatic dung beetle species, which probably evolved for 80mya in post-Gondwana isolation. It is unsurprising therefore, like many of NZ’s biological oddities, that NZ’s dung beetles are globally unique. Native NZ dung beetles are small, flightless, forest dwelling and, unlike their distant continental relatives, enjoy munching on bird poo (although, as we discovered, they’ll eat almost anything). Interestingly, birds are basically shrunken dinosaurs, so bird poo probably isn’t that different from what dinosaur poo would’ve been like. Following the extinction of dinosaurs, further diversification of dung beetles was elicited by the radiation of mammals (almost everywhere but NZ). But because they did not have the smorgasbord of poo that was available to dung beetles elsewhere in the world, the NZ taxa are relatively species poor. And there’s another twist to the story: despite the extinction of most native birds from the NZ mainland, native dung beetles are often recorded in massive numbers. This begs the question: without native bird dung, what are these dung beetles eating and what is their ecological role? We found that NZ dung beetles feed on a range of native reptile, bat, bird and insect dung and dead animals (basically everything that was put in front of them). We also showed that NZ dung beetles enjoy calamari, happily consuming the rotten squid that we fed them. Accordingly we suggested that NZ dung beetles evolved a broad generalist diet due to the lack of mammal poo. We also proposed that NZ dung beetles would have utilised marine resources such as seabird poo, carcasses and vomit. Before human arrival, NZ forests were a seething mass of seabirds, and native dung beetles could have been a key link in the flow of nutrients from the marine environment to forest ecosystems. Were marine derived nutrients an important food source for New Zealand dung beetles? Jamie Stavert is a PhD candidate at the Centre for Biodiversity & Biosecurity, School of Biological Sciences, University of Auckland. His MSc research was on dung beetles, but he has switched to smelling flowers and is now investigating how functional traits influence ecosystem function and species’ responses to environmental change in pollination systems. He is supervised by Jacqueline Beggs, Anne Gaskett, David Pattemore and Nacho Bartomeus. How many exotic invertebrates in New Zealand? 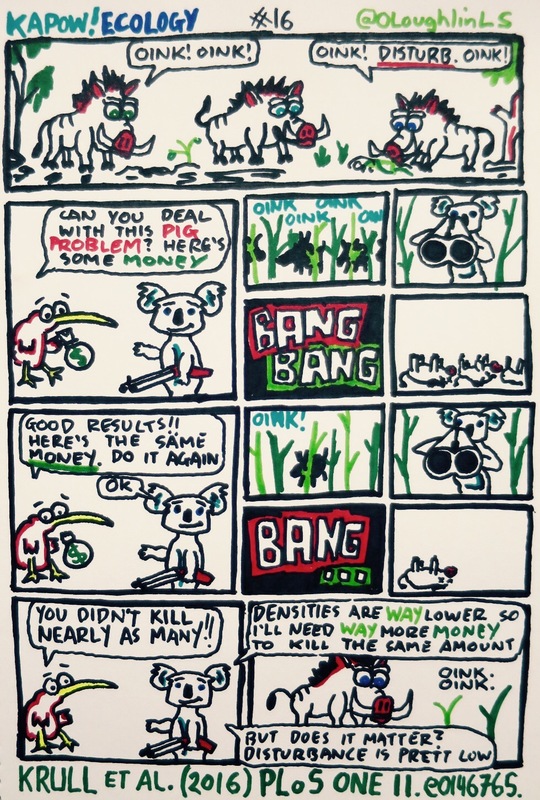 New Zealand is well known for its problems with exotic pests and weeds; whether it’s vertebrate predators and their devastating impacts on native birds, vertebrate herbivores chomping through tonnes of native vegetation per night, or weeds out-competing and smothering native species. Relatively speaking we have excellent information on the number of these exotic species, their distributions, densities, and impacts. But what about exotic invertebrates? How many are there in New Zealand? Apart from a relatively small number of high profile species, the total number of exotic invertebrates species established here is only a ‘best guess’. However, generating such information is an important part of studying invasion biology, particularly when such information is compared and contrasted with other parts of the world. Hymenoptera are a massively diverse Order of insects, including bees, ants, wasps, and parasitoids. Humans have a love/hate relationship with Hymenoptera. They can be pollinators of economically important crops and of native plants, and have widespread application as biological control agents for the control of insect pests. However, when they are bad, they are horrid. Invasive ants, social wasps, sawflies, woodwasps, and gall wasps, all cause huge economic, social, and environmental problems in different places around the world. Asian Paper wasp on nest in Auckland. Recently, we completed the first inventory of all exotic Hymenoptera in New Zealand, and made comparisons to a large European database (DAISIE, Delivering Alien Invasive Species Inventories for Europe). We found several interesting trends. Over 300 species are established in New Zealand, more than in Europe (334 vs 286). The European fauna also had a much higher proportion of intentional releases (i.e. biocontrol, pollination), further highlighting the large number of unintentional establishments for New Zealand. Also strikingly was the ‘disharmonic island’ nature of New Zealand. One third of the taxonomic families in New Zealand have no native species, and are only present as exotic representatives, including common taxa such as honeybees, bumblebees (Apidae), and social wasps (Vespidae). We also found a change in the origins of exotic species establishing over time, with an increasing dominance of species from Australia during the past 25 years. Our project shows the importance of examining large-scale datasets of multiple species over long-periods. It also shows the importance of scientific collections – where much of this information was obtained. Last week the Royal Society of New Zealand launched their report on options for climate change mitigation for New Zealand entitled ‘Transition to a Low-Carbon Economy for New Zealand’. As part of the launch they released several infographics including a panel on what immediate actions individuals can make to reduce their carbon footprint. These included increased use of public transport and cycling, planting trees, using energy efficient appliances and reducing the frequency of air travel. Whilst these are all important and worthwhile actions, I feel that there is one obvious oversight, one big elephant, or more accurately in this case, cow in the room and that’s that there is no mention on this infographic for the need to reduce meat and dairy consumption. Now in order to be fully transparent…I’ll admit I’m a vegan and as my friends and family will attest, for someone who doesn’t eat any meat or dairy I do seem to spend quite some time talking about it. But while I’ll try to avoid climbing onto the soapbox for this one, I do feel that meat consumption is something that needs to and should be discussed. New Zealanders it seems, like their meat. NZ is often listed as one of the most carnivorous countries in the world, with annual meat consumption frequently quoted as being greater than 100 kg per person (with one estimate at a super-sized 126 kg), putting it well above the global average of 42 kg per year – according to this chart from the Economist, New Zealanders are the 4th biggest meat consumers in the world! Like many other developed countries, New Zealand’s meat consumption has remained fairly steady and is predicted to remain at similar levels for the coming decades. Globally however, it’s a different story. The demand for meat is growing, linked with increasing wealth and urbanisation of many developing countries. This increase in demand combined with rapid human population growth has seen meat production grow from around 70 million tonnes in 1961 to a huge 278 million tonnes in 2009, with further increases up to a whopping 460 million tonnes predicted by 2050. Now that is a lot of meat. The stated contribution of livestock production to current global greenhouse gas (GHG) emissions varies from around 10 to 25% (depending on whether emissions due to deforestation and land use change associated with pasture creation are included). But the regularly quoted FAO’s statistic of 14.5%, would put livestock production on par with the emissions contributed by the global transport sector. In NZ, agriculture contributors almost half (47% in 2010) of the country’s GHG emissions, 95% of which come from the pastoral system. On top of this, livestock production has various other substantial environmental impacts, such as high water use, groundwater contamination and biodiversity loss (summarised nicely here). Ways to mitigate these GHGs are often described in two parts; reducing emissions during production (see here for more examples) and reducing demand. The Royal Society’s report contains multiple potential technical options that could be used to help reduce production related emissions, such as increasing farm efficiency, developing methane inhibitors and selectively breeding lower-emission animals. However, although these technologies may decrease emission intensity, they are unlikely to limit overall emissions if total production continues to grow. So how about reducing demand? A global shift to a more plant-based diet, much lower in animal protein than the current average diet in developed countries, has been repeatedly suggested by the UN and others, as one practical way to tackle not only GHGs, but other environmental issues associated with human food production (see the end of the post for some links). For example, in their Fifth Assessment Report the IPCC stated that global dietary change could have a substantial impact on agriculture’s GHG emissions, with a potential saving of 0.7-7.3Gt CO2-eq/yr in 2050. Additionally, a recent study by Springmann et al. (2016) reported that a global move towards a low-meat diet, which limited red meat intake to 300g a week, would reduce the predicted 2050 food-related emissions by 29%. If people went further and shifted to a fully vegetarian or vegan diet then they predicted that the food-related emissions would be decreased by 63 and 70% respectively. Now I’m certainly not suggesting that everyone goes vegan, I understand and appreciate that there are many people that rely on the meat and dairy industry for their livelihoods, as well as the fact that many people simply enjoy eating burgers, sausages and cheese. But this isn’t about stopping eating meat but rather reducing how much and what type (beef, for example produces more emissions per kg of protein than poultry). And yes I know that New Zealand exports much of the meat (83% of beef) and dairy (95%) it produces, so a reduction in domestic demand in New Zealand will have less impact than in a country that consumes most of its own meat. However, that doesn’t mean that we shouldn’t act. Changing your diet isn’t going to ‘solve’ climate change, but it is one of the easiest ways individuals can help reduce their own environmental impact. It’s time to start talking about the cow in the room. So, anyone for a veggie burger? Food and Agriculture Organization of the United Nations (FAO). Tackling climate change through livestock – A global assessment of emissions and mitigation opportunities. Alice Baranyovits is a PhD student at the Centre of Biodiversity and Biosecurity, School of Biological Sciences, University of Auckland. She is researching the movements of kererū in urban areas. She is supervised by Jacqueline Beggs, Mick Clout, Todd Dennis & George Perry. It’s a story about pigs and takin’ money – get down girl, go ahead get down… And this is all going down across the Tasman; are you picking up their problem? ?